You don’t have to be an avid gardener to have the desire to grow your own herbs. After all, while you can purchase fresh herbs from the most basic market, you will pay anywhere from $2-3 dollars for them and it’s a one or two-time use of the herb. By growing your own you can have the reassurance that when you need herbs for a recipe, fresh rosemary or parsley will be a few steps from your back door or a short reach to the window planter to obtain any amount needed for the current recipe. A few of my favorite herbs, maybe because they are pretty much fool proof, are basil, thyme, parsley (flat leaf and curly leaf), oregano and rosemary. Aside from the basil and parsley, these will grow year round if your growing area is near the coastal region of Southern California and you don’t get frost in winter. There are a variety of basil to choose from. I’ve seen lemon, blue basil and your standard ‘sweet’ basil offered at most nurseries. Trader Joe’s (a Western region market) even sells 6″ post of basil. I prefer to buy 2″ or 4″ pots to plant. Basil, when planted in the spring, grows like a weed and can get 2′ to 3′ in height. The blue basil, while not as flavorful as sweet basil (in my opinion) grows very large and really looks like a perennial flowering plant. Talk about dual purpose planting! I grew a blue basil for 2 years and it never died back in the winter. However, as I mentioned, I don’t think the blue basil has the same great flavor that the ‘sweet’ basil has. Thyme is so wonderfully pungent and it enhances the flavors in so many different dishes that I consider this a ‘must have’ staple. The little thyme plant creeps, so plant it where you don’t mind it spreading a bit. There are also flowers that grown on thyme but try to keep them trimmed off so that the herb continues to add new growth. Parsley is delicious no matter whether you prefer the curly leaf variety or the flat leaf, sometimes called Italian parsley. I can’t keep it healthy year- round, the winter months are too cool for it to grow at my house, but it is well worth the $3 you might pay for a 4″ pot. Plant it in early spring and it will reward you all spring, summer and early fall with beautiful fresh leaves. Oregano is always easy to grow and while I don’t use it as often as the other herbs I’ve mentioned, I do love the flavor of fresh as opposed to dried oregano. Finally, Rosemary is probably the easiest plant to grown and can be used anywere in the garden as an addition to the perennial flowe bed. The upright Rosemary will become quite large over time, but you can cut it back by half and it won’t mind. There is a low growing variety that makes a nice border along a planting bed and serves as herbs for great grilled dishes as well as an easy to care for border plant. All of these herbs can be grown indoors in a sunny window. I would recommend taking them outside for a bath occassionally. Be sure to lightly fertilize your plants if they are indoors, DON’T fertilize the outdoor herb garden, it makes the herbs less flavorful. Do plant in well-draining, sunny soil and don’t overwater. If you decide to plant mint, another easy-to-grow herb, be sure to put it in a clay pot. It will quickly take over the flower bed and you will end up with mint everywhere, including the grass. I once read that the only ‘duty’ in the garden in August is water, water, water. I believe that summer can be hot any time Mother Nature decides she wants to warm things up. With most of California experiencing ongoing drought and possible water rationing, I thought I’d do a posting on what water conservation measures have worked in my garden. We live within 6 miles of the ocean (as the crow flies). There is a range of hills between us and the sea that makes our climate just slightly warmer than ‘living at the beach’. However, we do experience Mother Nature’s natural air conditioning (the ocean breezes) most of the time. Since it is 6-8 degrees warmer in my yeard than the temps along the coast I find I have to water at least 3 times a week. Potted plants need more than that. There are a few things I do that help keep the plants cool and safe from intense heat. One of the simplest things to do is to keep your soil well cultivated. I’m not talking about a deep cultivation rather a shallow 1-2″ cultivation of the top soil. This will allow water to soak into the soil. If your soil develops a hard, cracked surface you’ll have more run-off when you water, wasting the water and your time. I cultivate on a rotation basis since it takes a bit of time but I enjoy not only the weed control it allows, but the way the garden looks once I’m finished. The second thing you can do is to mulch around the base of your plants. I purchase organic compost to mulch with that way I am adding nutrients to the soil when I spread the mixture. Be careful when you do this, especially around annuals and vegetables. You don’t want mulch too close to these plants and you want to keep an even spread of the mulch to 1/2″ to 3/4″ thickness. If you have clay soil this will work wonders on breaking up the clay over time. You will have to do it annually to see results but it will be well worth it. With the exception of California native plants and well established drought-resistant plants, all plants need regular watering this time of year. Soil should be allowed to dry out a bit between watering. Water between 4:00 AM and no later than 4:00 PM to avoid mildew on roses. You should not water during the warmest times of the day as you will loose some of the moisture to evaporation. Sometimes I water both morning and evening on the same day, watering for a shorter amount of time, and find it soaks in better than a longer period of watering once a day. Experiment with your yard and see how your plants respond. For additional tips on working in the garden I recommend Pat Welch’s “Southern California Gardening” book, available at Amazon.com. I wanted to serve a meal that would be easy and fun for my 4th of July barbecue. I decided on a couple of tried but true recipes that I’ve used for many years now with great ease and success. Mexican Black Beans & Rice is a dish that can be prepared in advance, always a preference for me when entertaining, and it pairs beautifully with the Green Chili and Herb-Stuffed Chicken recipe. I urge you to use fresh ingredients, canned chilies and dried herbs will not give you the same great flavors you will enjoy if you use fresh ingredients. Fresh herbs and produce are easy to find this time of year and they are worth the visit to the market. I’ve included the recipes, if you have any questions feel free to leave me your Comments, along with your email and I’ll respond. Heat olive oil in a large non-stick skillet over medium-high heat until hot. Add onion and yellow pepper and saute until tender. Stir in cooked rice and next 3 ingredients; saute 3 minutes more. Add beans and chopped tomato, saute 3 minutes more or until heated through. May be prepared ahead at this point, place in oven proof dish and cover with foil. Reheat, covered, for 20-30 minutes at 350 degrees and serve. Mix 1/3 cup lemon juice, parsley, chilies, rosemary, thyme, garlic and 2 teaspoons salt in medium bowl. Slide fingers between chicken skin and meat to loosen slightly and form pockets. (If using skinless, place all ingredients in the baking dish, place chicken breasts in marinade and turn once half way through marinating time). Spread herb mixture in pockets under skin. Arrange chicken in single layer in large baking pan. Sprinkle with vermouth, remaining 1/3 cup of lemon juice, lemon peel, remaining 2 teaspoons of salt and pepper to taste. Turn chicken to coat. Chill overnight, turning once. Grill chicken over medium coals until cooked through, about 10-15 minutes. I hope you enjoy these recipes, they are two of my favorite Backyard BBQ recipes for summer. Since 4th of July landed on a Saturday this year, we decided to host a small party of friends for the celebration. Each couple brought some part of the meal and a bottle of wine. Thankfully pot luck style has become a standard practice within my group of friends. I’m not sure if it’s my age or simply the fact that it makes entertaining so much easier, but I love it. 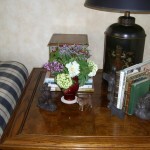 It gives me more time to be creative with the table setting and other details. 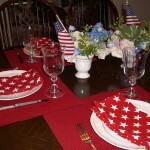 Once I knew I was going to have this party I decided I wanted some festive cloth napkins for the dinner table. 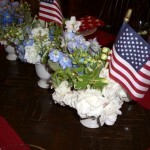 It was challenging to find napkins that were suitably simple and ‘patriotic’ in appearance. So after an unsuccessful search of local stores, I decided I’d attempt to find the fabric online and make the napkins. I searched online for discount fabric sites and found Warehouse Fabrics. They have a wide variety of fabrics and the price was very reasonable. I ordered 3 yards of a crimson red cotton with white stars. The fabric was $6 a yard and it afforded me 8 napkins, not bad for $18 + tax. I hand stitched the hems, mostly because I was too lazy to get the sewing machine out. The napkins added to my table setting.